Red, a renowned singer and the protagonist, stands mournfully over the slain body of a mysterious man. A massive sword, known as the Transistor, is pierced through his chest. However, this beautiful weapon is also imbued with a comforting voice. The voice of a friend. Red pulls the sword from its recently deceased victim and embarks on a journey. Though the Transistor insists that they leave town, our musically gifted hero has other plans in mind. She’s going to hunt down those responsible for this vague transgression. 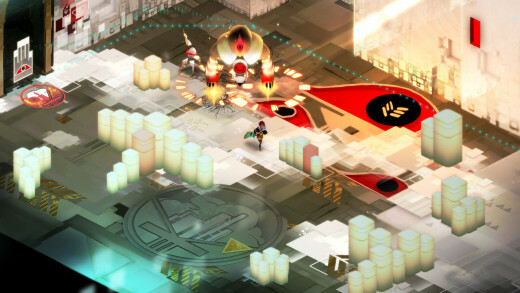 Like this review, Transistor’s opening is very abrupt. At first, I thought I’d somehow skipped an intro cinematic because the game throws you into the thick of the plot with almost no set-up or context. 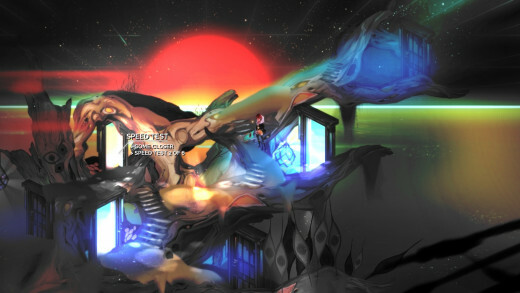 I was frustrated by this initially, but later realized that this unorthodox storytelling contributes to Transistor’s intoxicating mystique. Pieces of the plot are revealed as the game progresses, leaving it up to the player to connect the increasingly large dots. All you know is that a group of individuals calling themselves the Camerata has, for whatever reason, unleashed a malevolent entity called The Process that's decimating the city of Cloudbank. They don’t beat you over the head with details and I grew to appreciate the intentional ambiguity. It allowed me formulate my own theories about the narrative and the mystery itself was engaging enough for me to want to see the story through to its surprising conclusion. Don’t worry, by the last third of the game, you’ll have a pretty clear idea of what’s happening and once you finish, you’ll want to take that newfound clarity with you in a second playthrough. Red’s voice was somehow lost so the Transistor does all of the talking. The difference between the sword and the narrator from Supergiant’s previous game, Bastion, is that he doesn't narrate. Rather, he’s more of a one-sided conversationalist. He'll offer Red his thoughts and advice, the occasional joke, or simply ask if she's okay. He's not an all-knowing voice - he's trying to make sense of things just like the rest of us and because of this, you grow to care about him as a character than as simply a delivery system for charming dialogue. It was a relief to find that the Transistor wasn't just the Bastion narrator 2.0. The futuristic city of Cloudbank provides a fascinating backdrop because, like everything else, you never quite know what this crazy town is all about. Terminals sprinkled around the city provide the only glimpses into everyday life. Citizens use them to vote in polls ranging from the ordinary, such as a talent competition, to the seemingly impossible, like which color the sky should be next or the weather for the day. Is this society actually capable of such feats? Who knows, and that's the fun of it. Seeking out every terminal became a necessity for me because I wanted to unearth any nugget of information about this strange place. It also helps that Cloudbank is absolutely gorgeous. 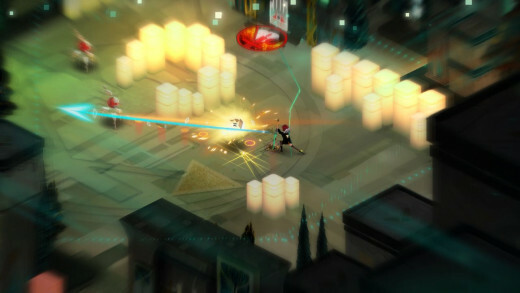 Transistor plays as an intriguing hybrid between the isometric action of Bastion and turn-based strategy. Red has the ability to halt the flow of time to freeze enemies in place. During this suspended state, players can plot a string of attacks, with each use limited by a duration bar (stronger moves take up more of the bar than weaker ones). The set-up is vaguely reminiscent of selecting commands in Final Fantasy XIII. 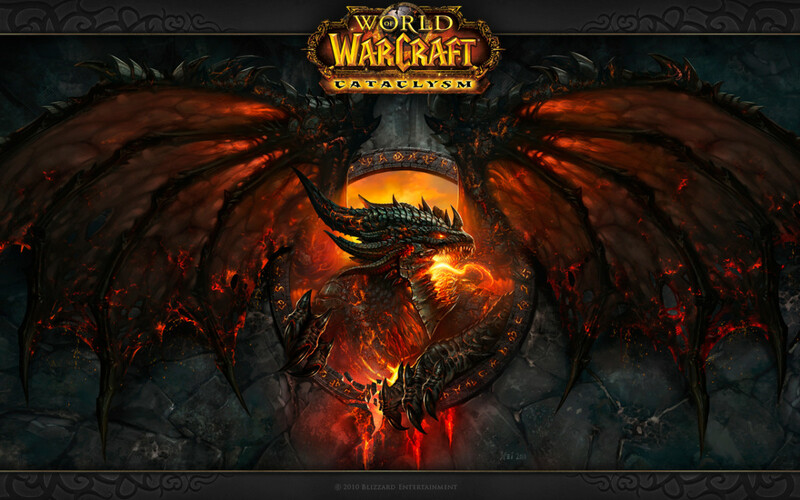 Returning to real-time causes Red to unleash your planned assault in a Flash-like flurry. Careful planning during this mode can reap hugely satisfying rewards. 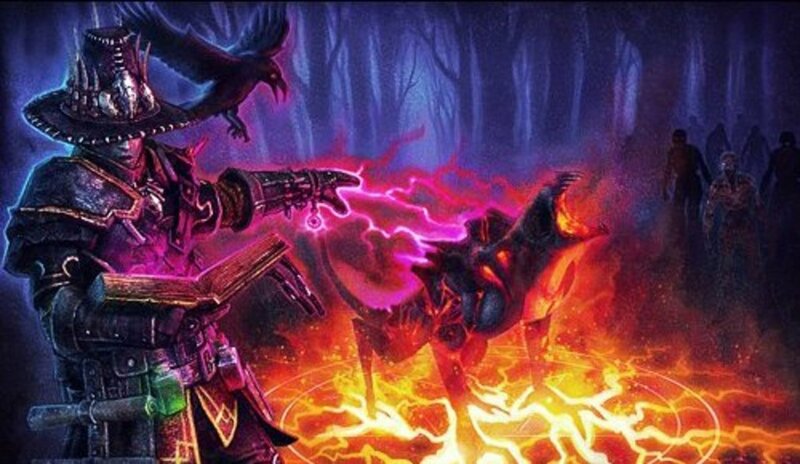 Play your cards right, and an entire group of adversaries can be vanquished in a single turn. Ceasing time is also nifty for avoiding damage. If something’s about to hit you, simply pause time and move aside. An deceptively long cool-down period combined with very aggressive and durable enemies helps maintains balance and keeps the tension in battles. Red is armed with a variety of attacks called Functions and up to four can be equipped at once. Each Function slot has two, unlockable, upgrade slots. Placing a Function in the upgrade slot grants a bonus effect to the move set in the Function slot base attack. Functions can also be equipped in separate passive slots, which add buffs to Red herself. Here’s an example of how everything works. The Function called Ping (my favorite) is a rapid-firing, though weak, projectile. After tinkering with a few combinations, I eventually struck gold by outfitting Ping with Purge, a corrosive attack eats away health while also slowing movement. In the second slot, I chose Bounce, a ricochet attack. The added assist from those two Functions transformed Ping into a speedy fireball that bounced between enemies, both decelerating them and dealing lingering acidic damage. 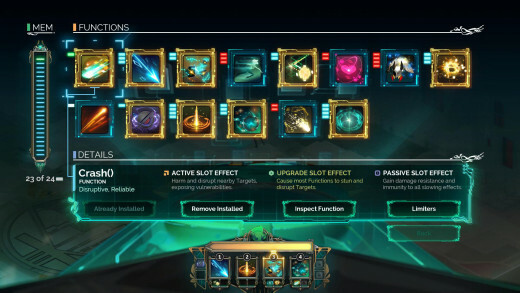 It’s an incredibly deep system and assembling a load-out of multi-layered Functions that cater to your play style is one of the main joys of Transistor. Experimenting with the plethora of combinations is extremely addicting and coming across that perfect combination, like my oh-so sweet Ping combo, is thrilling. Another small, though welcomed incentive for mixing things up is that each Function carries a character’s history, including Red herself. By meeting certain criteria, such as combining certain Functions to achieve a specific effect or using it as a buff, you’ll unlock more information on that person. Since I was determined to obtain as much lore as possible, I ended up completely uncovering every character’s bio. That meant that I’d played with countless different loadouts and I can't think of a single one I didn't enjoy. Functions also act as Red’s lives and dropping to zero health causes one of them to overload and become unusable for the next two checkpoints. Thus, you can die up to four times before getting an actual Game Over but dying even once can be a huge blow. There’s nothing worse than losing your staple Functions for a couple of battles, but the challenge of scraping together suitable replacements with remaining options is strangely exhilarating. Failure is severely punished, but it literally forces players to give new tactics a shot and rethink their approach on the battlefield. I love that. Limiters can up the challenge even further. 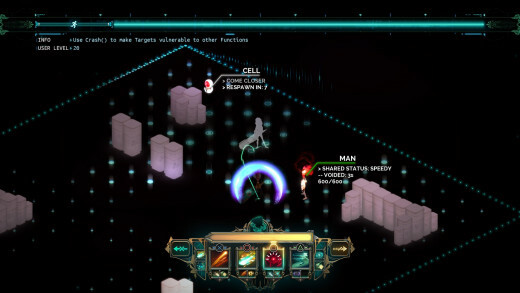 Equipping these optional ailments effectively raises Transistor’s difficulty by granting damaging effects that include more powerful enemies, decreased Function availability, and even overloading a Function if it’s unequipped. Why would anyone hinder themselves like this? Playing with Limiters on grants additional XP, so those brave (or masochistic) enough to stack multiple Limiters at once will level-up very quickly, very soon. This risk vs reward system is a really cool alternative to the standard difficulty options and handsomely compensates the personal hell players choose to create for themselves. Backdoors offer the only diversions outside of the main game. 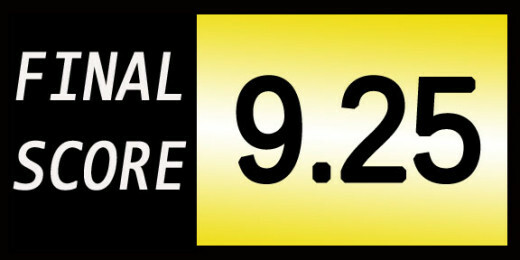 These areas contain challenges for players to earn XP outside of battles, such as time trials, a sort of horde mode, and others. 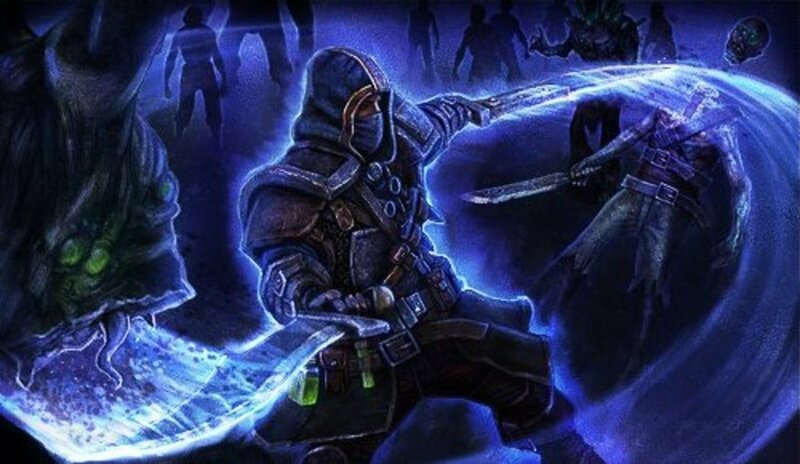 My favorite was the planning challenge, which tasks players with eliminating several enemies in a single, suspended turn using pre-selected Functions. It's basically an elaborate puzzle and it's a great way to sharpen your planning skills as well as discover new strategies you may not have otherwise. Completing each challenge unlocks new music tracks for your listening pleasure and considering how wonderful the music in this game is, it's a prize worth seeking. 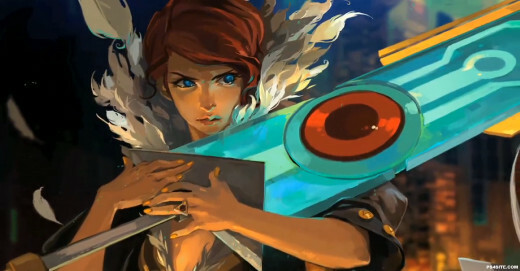 With Transistor, Supergiant Games has hit another homerun to solidify themselves as one of the industry's premier indie developers. 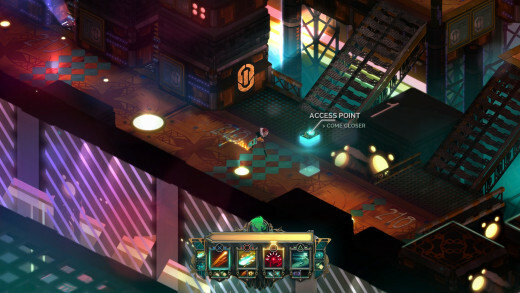 With an attractive art style, great soundtrack, and a creative twist on turn-based combat and skill-building, Transistor is a game as beautiful and alluring as it's red-headed heroine. I can't wait to see what Supergiant has up it's sleeves next.